William Eckert was born the 13th of August 1797, in Virginia[i], spent some time in Ohio, before coming down to Jackson, Missouri[ii] where the young man opened his first Mercantile. He served in the War of 1812[iii] and then arrived in the young village of St. Charles, where he married Francina “Fannie” Smith in the old Borremeo Church [Saint Charles Borromeo Parish] in 1818[iv]. This enterprising young man opened a tavern calling it the Sign of the Buffalo [Bradden’s Restaurant, 515 South Main Street][v] that then vied for being the location of the temporary State Capitol [Missouri’s First State Capitol, 200 S. Main] with the Peck brothers, Charles and Ruloff, when it was coming to St. Charles in 1821. Despite proving that he had a better location, Eckert lost out, most probably ­due to the politics at the time. This promising young businessman went on to become a trustee[vi], and the treasurer for the village of St. Charles[vii], and run the postal route between St. Charles and Bowling Green[viii]. He was also one of four owners in the Steam Ferry Boat Company that ran on the Missouri River with their boat the James Morrison. [ix] His partner Francis Yosti was a son-in-law of the James Morrison who lived down at the corner of Clay [today First Capitol] and Main [today’s Berthold Park]. 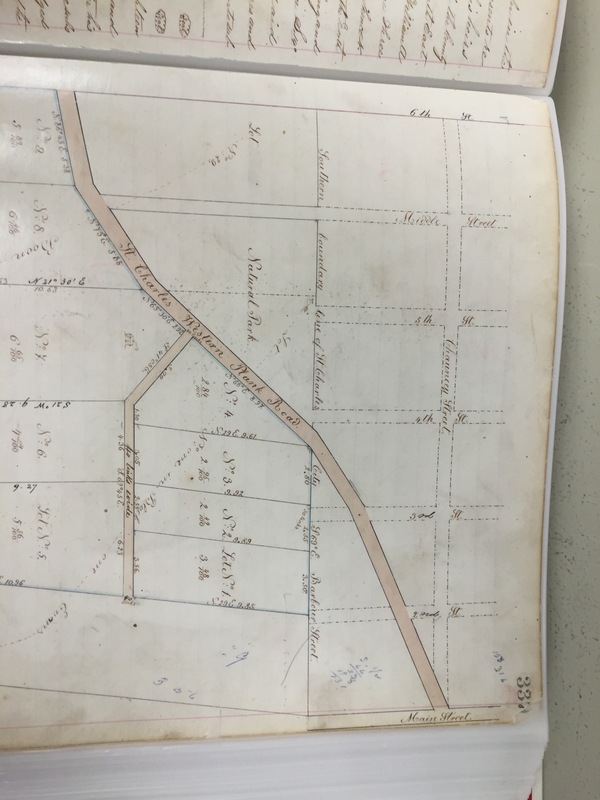 Eckert’s own son-in-law was the 21 year-old Franklin Newbill who owned the woolen mill at the corner of Main and today’s Boone’s Lick Road [Trailhead Brewing Company, 921 S. Riverside Drive], who had married his 16 year-old daughter Marian “Polly” on the 3rd of December 1835[x]. They would later live in a two-story brick house on Main Street [Newbill-McElhiney house, 625 South Main] which was built on a lot Eckert had bought from John Yarnell on the 4th of February 1824. [xi] Over the years, Eckert and Newbill were in business together, but by October of 1845, they had had a falling out and Newbill was totally out of the picture. William Eckert and his family were living there when Eckert died on April 2, 1846. Today, that small 147 foot by 147 foot half-acre plot lies somewhere along the hillside on the south end of St. Charles near the Crestview Apartments. It is hard to imagine a cemetery there today. Nearby the Western House [1001 South Main], where his widow, Fannie, it is said, ran the inn for travelers leaving St. Charles on the Boone’s Lick Road. Funny the things you find when you’re not looking for them. When I found this mention of Eckert’s grave, I was researching the Boone’s Lick Road. I thought St Charles was selected as the temporary capital specifically because the combined space above the Peck brothers’ store and residence and Chauncey Shepherd’s residence was available and offered free of rent. Are you implying that the representatives from St Charles were offering a choice of spaces for free and that the decision to use the Peck brothers/Shepherd space was made after the selection of St Charles as the temporary capital? Yes, I am. They were offered a larger space at what was Eckerts Tavern. However, they still didn’t get “the contract” did they?